Which mower blades should you be using with your mower? There are several designs out there, each with its own advantages and disadvantages. Here’s how you can tell them apart and choose the right ones for your needs. A blade doesn’t just slice: it also acts as a fan, pulling the grass up to get an even cut. By adding extra lift, large clippings can be blown back up into the mowing chamber to be cut again. Modern mulching decks use this to slice grass into small pieces that can be digested by microorganisms in the soil. Due to their lower surface area, small clippings don’t catch as much wind and can fall through the blade and onto the turf. A stamped deck can be shaped to have a round chamber that hugs the blade, increasing vacuum. Constructed decks have flat sides, creating turbulence and increasing the chamber size, decreasing vacuum. Most companies that sell mowers with constructed decks offer mulching kits that include baffles. These reshape the mowing chamber to give it more vacuum while still letting grass move across the deck toward the discharge chute. By fine-tuning the shape of a blade, it can be built to suit specific types of mowing. These blades have an almost flat profile that flings clippings out of the chute instead of throwing them up to be recut. This reduces the amount of grass being cut at a time, lowering the stress on the deck. These blades are lighter than other designs, increasing maximum blade speed and taking stress off of the spindle bearings. By moving clippings out of the deck as soon as possible, the mower is able to cut thicker, taller grass. These blades use steep angles to move more air, increasing vacuum. Some manufacturers also add cutting surfaces to the back edges of their mulching blades. While this doesn’t help with the initial cut, it does help chop clippings down to size so the deck can handle thicker grass. Dixon takes this a step further with their Gator blades, offering three designs that let buyers choose between low weight and high tip speeds or more cutting power and a longer lifespan. The type of blade needed for bagging will vary depending on the mower design. Some decks need to be used with a low-profile side discharge blade to hurl clippings through the side discharge and into the hose that leads to the bags, while others are designed to mulch clippings, compacting them for more onboard storage. 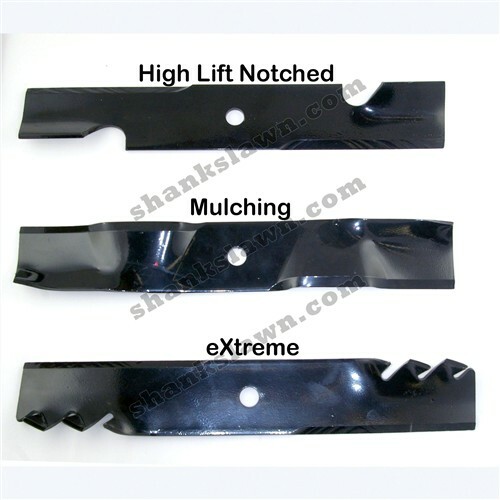 Blades designed for bagging and either side discharge or mulching are commonly labeled “2-in-1.” These blades are designed with the deck in mind for the best bagging performance, using a profile for bagging and side discharge or bagging and mulching. “3-in-1” blades are designed for mulching, bagging, and side discharge, but covering all three modes means making some compromises to performance. If you have a choice between 2-in-1 or 3-in-1 blades, go for the 2-in-1 design. Most mower blades use a quench-and-temper process to create a hard surface on soft steel. This results in a blade that is flexible enough to absorb impacts while having a long-lasting cutting surface. Fisher Barton’s Marbain blades use austempering instead of quenching and tempering. This process takes longer, but it leaves the blade with a surface that’s harder than standard blades and is free of microcracks that can lead to failure. Scag worked with Fisher Barton to make these blades the OEM standard for their mowers. While they may be pricey, owners report lower cost of ownership and less maintenance thanks to these blades’ ability to hold an edge. No matter which mower you use, Shank’s Lawn Equipment has the blades you need to get the best cutting performance. We’re an authorized dealer for several major mower brands including Dixon, Scag, and Woods, and we stock aftermarket parts from manufacturers including Oregon, Rotary and Stens. We’re located at 4900 Molly Pitcher Highway in Chambersburg, PA. That’s one mile east of I-81 via Exit 10. We also ship parts across the U.S. and Canada so you can get the blades you need for your mower with a few clicks of your mouse. To order, visit www.shankslawn.com. This entry was posted in Uncategorized and tagged mower blades, mower parts, Shank's Lawn. Bookmark the permalink.